This is a double layered bow. The bottom is a 1.5" black and the top is a 5/8" red with white polka dots ribbon. Both are made of grosgrain ribbon and the center is wrapped in a French knot with the polka dots ribbon. 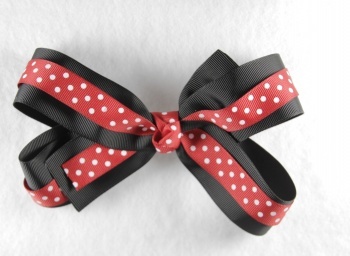 This has great colors of black, red and white mixed with polka dots all in one awesome bow!